Therefore, the World Wide Web Consortium (W3C) stepped in and created a standard for creating with HTML. And so, DOM Level 1 was born. The DOM API has two big groups of methods. The core: which is used for every XML based document and the DOM HTML extensions: for html specific objects and methods. The internet evolved and so did the API. 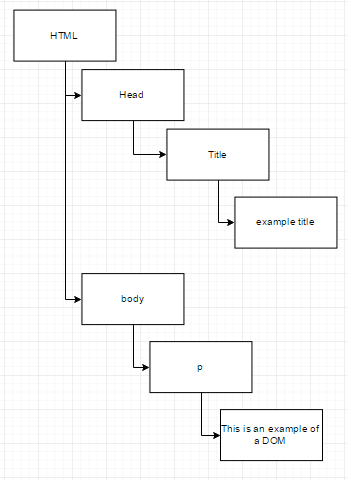 Level 1 focused on the structure of a document, whereas Level 2 added support for mouse and user-interface events as well as better Cascading Style Sheets (CSS) and traversal methods to iterate over a DOM document. Then came Level 3 which added load and save functionality and validation methods. You might also hear about DOM level 0, but this never existed. NN4 and IE4 use it to reference to the original DHTML. => More detailed info about each level. It’s not mandatory, no government enforced a browser manufacturer to use the standard. As a result, not all browsers support everything. A clear overview of which browser supports what is currently not available (read: I can’t find one). As a result, my first option is to go to ‘Can I use‘ and if I can’t find it there, I go to Mozzila’s Developer Network. It covers every method and function, and contains information about browser compatibility. Hence, use feature detection if you implement an unsupported method. Otherwise you can prompt the user to upgrade to an other browser that does support the recommendations of the standard. Fortunately, most of the modern web browsers implement all of the Level 3 specification. Do other XML based formats have an API? Is DOM and HTML the same? Both were ment to be the same, but they weren’t, therefore a standard was needed and ECMA (European Computer Manufacturers Association) stepped in. So they created a commitee of programmers from Netscape, Sun, Microsoft, Borland… and produced standard Ecma-262 alias EcmaScript. Now it was up to the browsers to try and implement that standard. 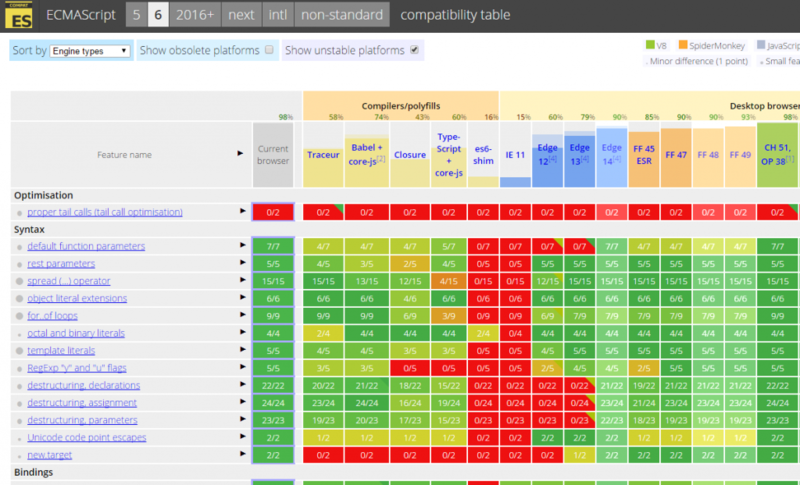 This is an awesome resource to check and verify compatibility differences between all the browsers and there versions. In addition, a code sample is provided for each test. This is handy for if you encounter a browser that isn’t listed in the compatibility table. 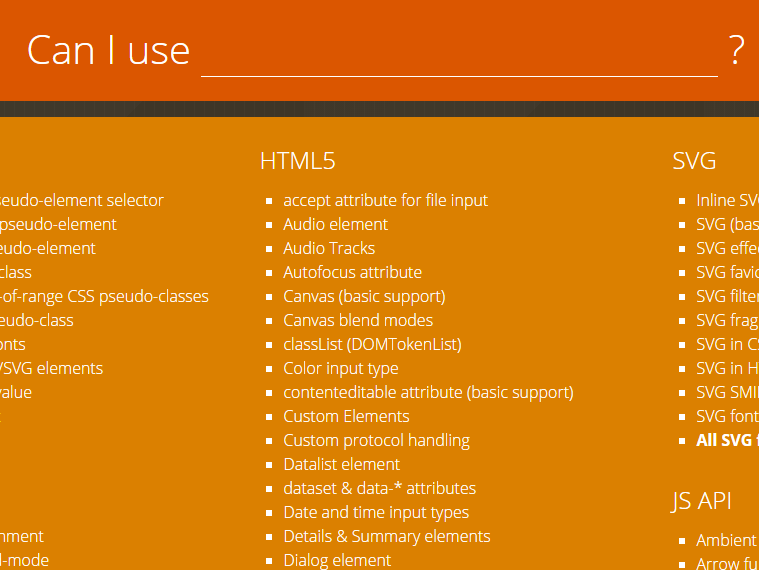 But you can also learn how to use the features of EcmaScript-262 by looking at specific examples. A handy resource to check for compatibility of certain features is Can I use? What does ECMA-262 specifiy exactly? It defines the syntax (curly braces…), the data types (string, float, object…), statements (if, switch, do, while, with…), Keywords (if, switch, break, continue…), Reserved words (abstract, arguments, boolean…), Operators (+, -…), Objects. Which other languages use ECMA-262? and do they all use the same edition of ecmascript? JScript.NET: Microsoft’s variant got an upgrade to a full programming language insteas of a scripting language (read: you have to compile it to make it work). ActionScript: Adobe Flash, Flex and Air. Currently on edition 4. ExtendScript: every other program from Adobe. edition 3. Are all these languages the same? Can I just copy code from one into the other. If only it was that easy. They all implement ECMA-262 but they also have their own extensions and features that make them unique. Which other ECMA standards are important to know. Here you can find them all and even download the standards in pdf format. HTML and CSS by� W3C are mandatory to know. But beware, browser implement them slightly different, so look up the differences (Can I use?). It depends on the browser your code is running in. So you don’t know which one you are using untill you (or someone else) runs your code. Furthermore, the editions are backwards compatible. As a result, what worked in an older version will also work in a newer one. There are two possible solutions to this particular problem. or 2. Use feature detection. If the feature exists use the fance code otherwise, use supported code from an older version. But some features are undetectable, as a result user agent sniffing is your only option.